Instead of displaying multiple notifications, you can create one notification that summarizes them all. 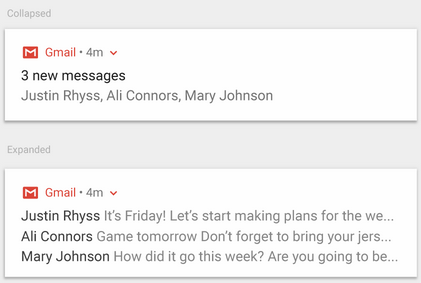 For example, a messaging app might have a summary notification that says "3 new messages.” Upon expansion, it could show a snippet for each message. Value: If true, notificaiotns will be stacked. Value: summary text, default is new notifications.